You scream, I scream, we all scream for ice cream…..especially if it is Cookies and Cream Key Lime Ice Cream! It is the perfect dessert for adults and kids alike! 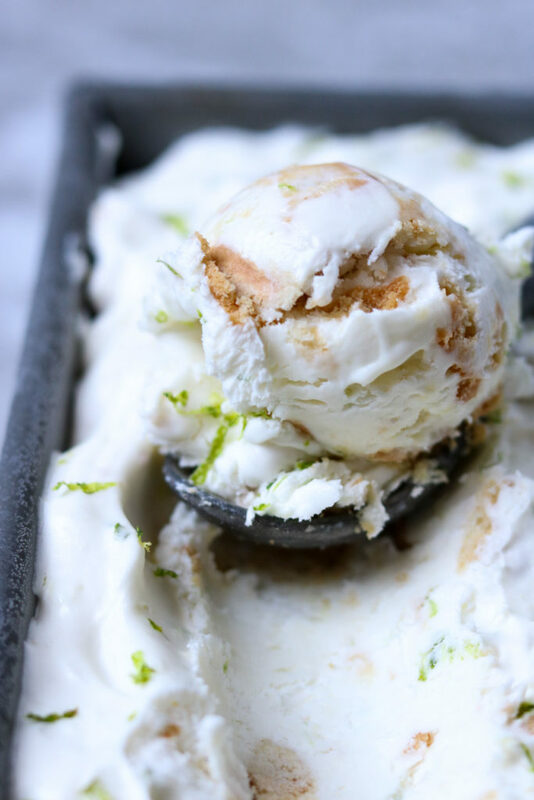 Cookies and Cream Key Lime Ice Cream is a super delicious dessert. It is full of refreshing citrus lime mixed with sweet cream, a touch of sugar and chunks of crushed vanilla cream cookies. A perfect summer twist on traditional cookies and cream ice cream. 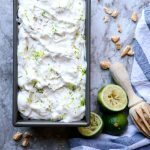 One amazing bonus of this key lime ice cream recipe is that you do not need ice cream churning equipment to get the job done. Yet you still get the creamy sweet goodness of traditional ice cream. All you need is a stand mixer or hand held mixer with a whisk attachment, and a freezer. Another amazing bonus of this recipe is that it is super kid friendly- making and eating. Older kids can zest the limes. Juicing the limes, especially if you have one of those hand held juice presses. Measuring and pouring the ingredients into the bowl. If you have a stand mixer, kids love to turn it on and off. Crushing the cookies in the plastic bag. Pouring the cookies and cream mixture into the pan. Now I KNOW that I used the words “key lime” in the title of this dessert, yet it doesn’t call for key limes specifically. It is really just to convey the flavor of traditional key lime pie. Key limes are not something I am interested in chasing down. 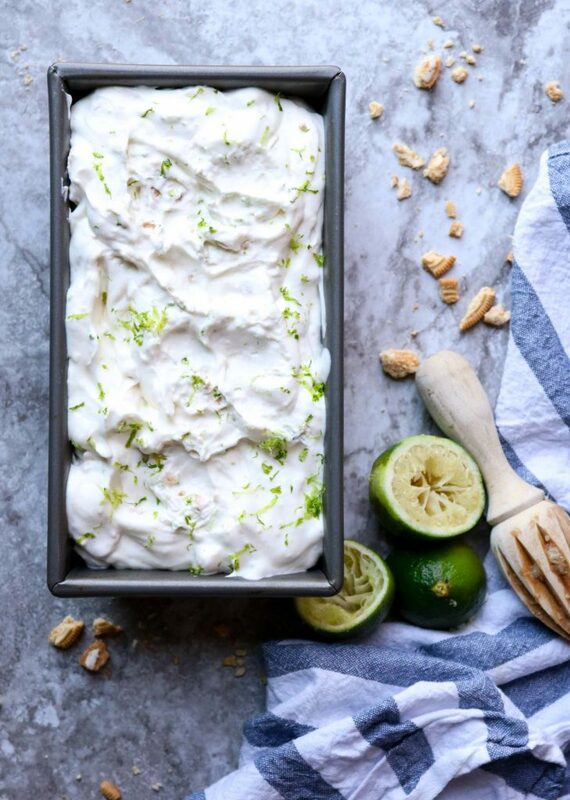 Especially when this dessert is just as delish with regular old limes. 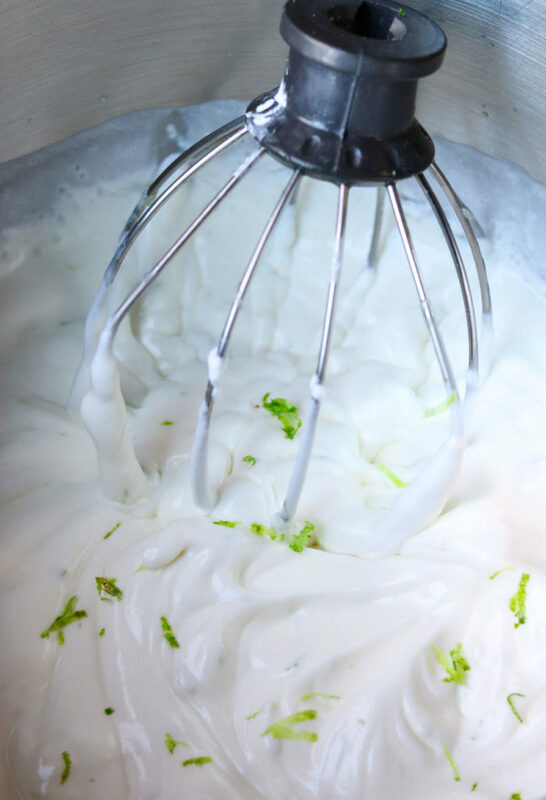 Whisk the heavy whipping cream with a stand mixer or hand held mixer with the whisk attachment, on medium high speed, until you have stiff peaks. Stiff peaks is when you pull the beater out of the cream and the mound that pulls out holds its shape and has a sharp tip. 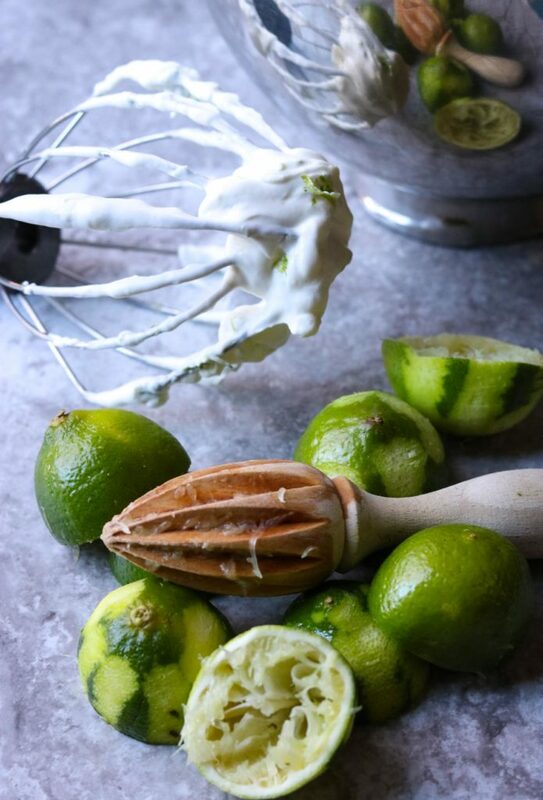 Lower the blender speed to medium low and sprinkle in the powdered sugar, drizzle in the sweetened condensed milk, pour in the lime juice, and the lime zest. Once it is all incorporated stop whisking. 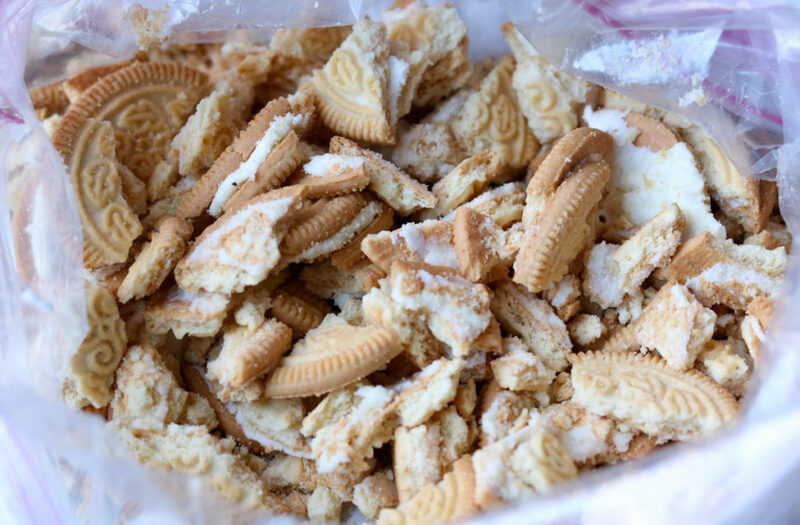 In a large plastic baggie crush the cookies until you have smaller bite size pieces. Do not crush it to dust, you will want some cookie chunks in your ice cream. A rolling pin, smooth meat mallet, or small frying pan will all work great to pound the cookies into pieces. With a spatula fold the cookies into the cream mixture. Pour the mixture into a glass or metal loaf pan. Cover the pan with plastic wrap and place in the freezer. Bare Naked! Just keep it as is, simple and delish. Get super crazy and do all four…. If you are now singing the song from Yo Gabba Gabba in your head “try it, you’ll like it”… you are my people! 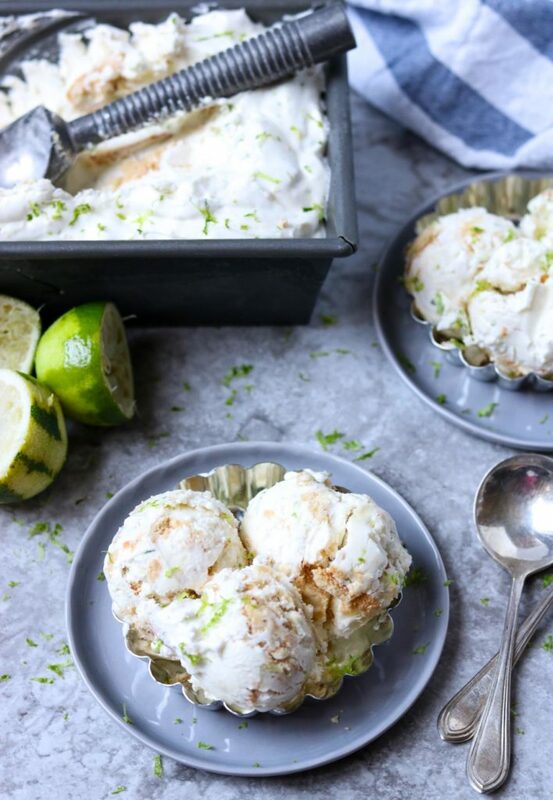 I hope you give this recipe for Cookies and Cream Key Lime Ice Cream a try in your kitchen. Cookies and Cream Key Lime Ice Cream - No Churn! 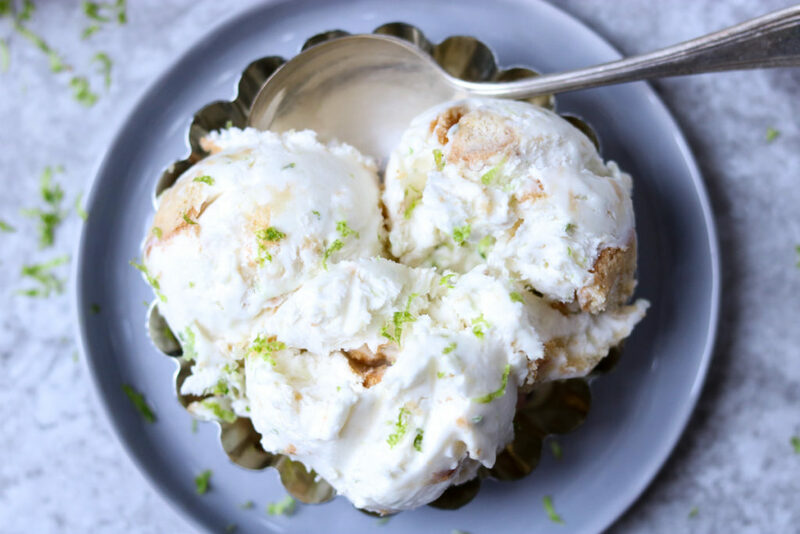 An easy and refreshing, sweet key lime ice cream with chunks of vanilla cream cookies. No special ice cream making equipment needed (no churn). 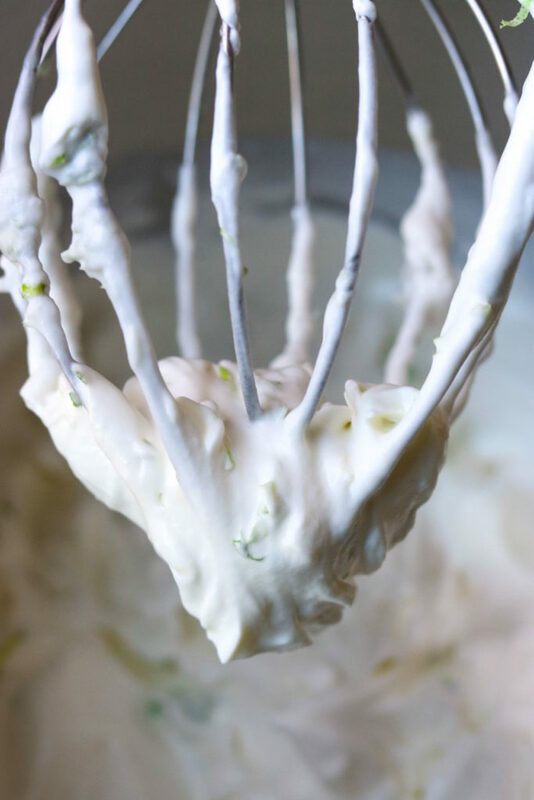 Using a stand mixer or hand held mixer with the whisk attachment, on medium high speed, whip the cold heavy whipping cream until you have firm peaks. (Firm peaks are when you pull the whisk out of the cream and a peak with a sharp tip forms and holds its shape). This will take 2-3 minutes. Turn the mixer to low speed and sprinkle in the powdered sugar. Next slowly pour in the sweetened condensed milk, whisk until it is combined, about 20 seconds. Add the lime juice and lime zest. Whisk for an additional 20 seconds. Set aside. Place the cookies in a large sealable plastic baggie. Crush the cookies- using a rolling pin, smooth meat mallet, or small frying pan works great. Do not crush it to dust, just to smaller bite sized pieces. Like the size of a nickel or dime. Gently pour/scrape the mixture into a freezer safe glass or metal loaf pan. Cover and freeze for 6+ hours. Scoop the frozen ice cream out into serving bowls or ice cream cone. Add toppings of your choosing: whipped cream, sprinkles, lime zest, crushed cookies, or whole cookies. My family loved and helping make this! Totally tastes just like key lime pie! AWESOME!!! I’m so glad you loved it. Thank you so much for letting me know. Thank you… the flavor is drool worthy! We will definitely be making this! My kids love making ice cream though ours usually involves shaking a jar forever. This looks a lot easier! This is much easier than shaking or rolling a jar. But, the kids can definitely still help. I have a list in the post about what the kids can help with (or what my kids like to help with anyways). I hope you enjoy it! Oh, wow! This looks perfect for the warm weather. I just got my first stand mixer for Christmas and am on the lookout for new ways to use it, so thank you for that too! I use my stand mixer for this recipe. It makes it soooooo easy! You can set the cream to whip while you crush the cookies. Perfect time saver. I hope you enjoy it! Let me know. I have been pretty well rendered speechless! I can’t believe you did cookies and cream AND lime! It must totally taste like a key lime pie!! My favorite! Yum! I am giving this a try ASAP! Thank you! It is a crazy good combo!! It tastes just like key lime pie- with the crust mixed in. You got me at key lime pie that is my favorite dessert and then in ice cream I am in! Your pictures look scrumptious. I love key lime pie too, so this was the perfect recipe for me! Thank you so much, Adriana. This sounds perfect for the warm weather. 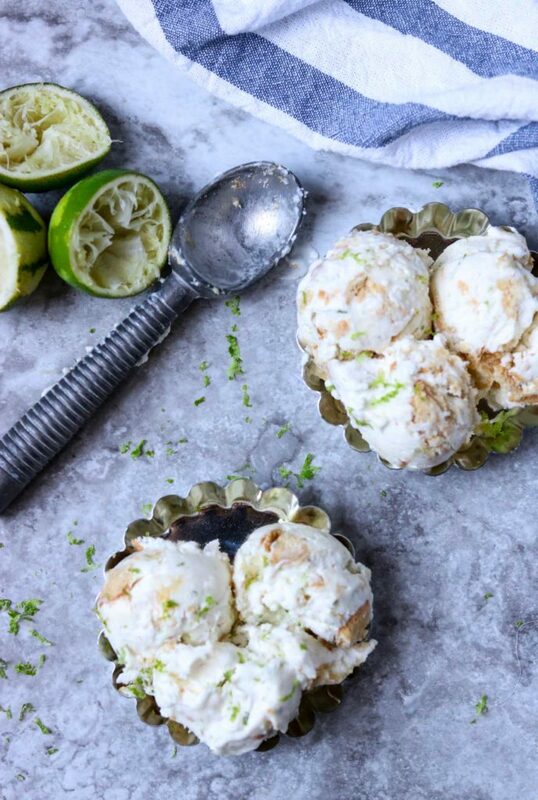 Love the sound of key lime ice cream. Sounds so tropical and delicious. It makes me want to go to Florida asap! It is the perfect dessert for summer, bbq’s, and cinco de mayo!